posters from the collection of Dennis Hickey, please visit his poster site!. Many thanks to Dennis. Part fact, part mystique, the music emanating from Texas has long drawn interest from around the globe. Texans have been involved and up front and present in the evolution of every American musical form for the 20th Century. From Scott Joplin to Janis Joplin, from Bob Wills to Asleep at the Wheel, from T-Bone Walker to Stevie Ray Vaughn, from Buddy Holly to Destiny's Child, Teddy Wilson to Van Cliburn, Texans have been there, done that. Like strong, enduring links of tungsten carbide, the chain of incredible Texan musicians to influence music in America is truly astounding. In fact the web just may not be big enough to hold all the information about Texas music! So, we'll content ourselves to focus on one remarkable decade, the '60s. Following are remembrances of things past: the clubs, the bands that played them, the record labels that made them, the media that hyped them and the graphics that illustrated them. Much of what is contained here is rare archival material. 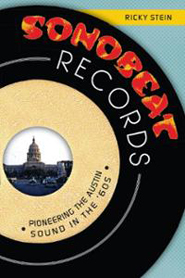 First hand accounts abound, the true stories of what it was like to make music in Texas in the 1960s. Have something to add? Contact us! 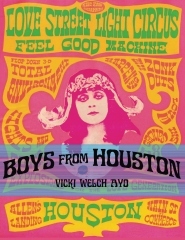 The definitive book about Houston and its musicians featuring stories of 1960's Houston, Texas. 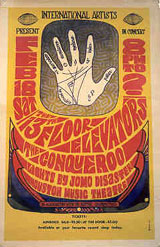 This music retrospective book glimpses rare photographs and interviews with the musicians and in-crowd that made this happening scene explode in the decade of the 1960's in Houston. The story is told from the stage and behind the scenes. The music scene in Austin is known the world over, but it can place a considerable portion of its roots in a little-known but prolific indie label: Sonobeat Records. A small, independent label founded by father-and-son duo Bill Josey Sr. and Bill Josey Jr., Sonobeat set the stage for the Capital City's musical legacy. The label's brief but powerful tenure produced an enormous amount of music and directly preceded the progressive country movement and the proliferation of a music scene that would earn Austin the nickname of "Live Music Capital of the World." Musician and author Ricky Stein explores the roots of Austin's contemporary music history through the story of one small but essential label. Amazon | Austin Chronicle article | The Return of Sonobeat Records! The JFK Assasination Connection  Did Monte di Monti Conspire with Jack Ruby and Lee Harvey Oswald? "I'm involved in a really big project down here that will catch everyone off guard, all over the world. Lee knows everyone down here and alot of them have serious bread and want something done about Kennedy." 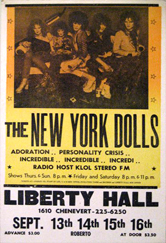 Since 1999 bringing you the best information about the fascinating era of 1960s music! All contents ©2014 1960s Texas Music unless otherwise noted. All rights reserved. 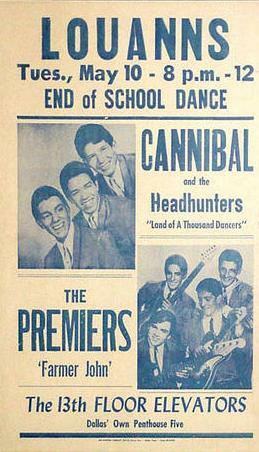 1960s Texas Music wishes to thank the numerous contributors to this site. The results are a colaborative effort! More news from Sonobeat Records! newly revived Austin label reissues entire Lavendar Hill Express recordings. Live performance and release party July 26 at Austin's Saxon Pub with The Sweetarts. More great new articles in our expanded West Texas section! '70 film: KPFT transmitter bombing by the KKK. Unseen in over 30 years! Houston Retro Radio airchecks from many of the great top 40 Houston radio stations. FM radio "free form" radio. posters from the collection of Dennis Hickey. A huge thanks to Dennis.